From 1954 to 1965 these lands were used almost exclusively for duck hunting and were known as the Ace Gun Club. This hunting club was established in 1953 and became one of the most successful gun clubs in the lower Yakima Valley. 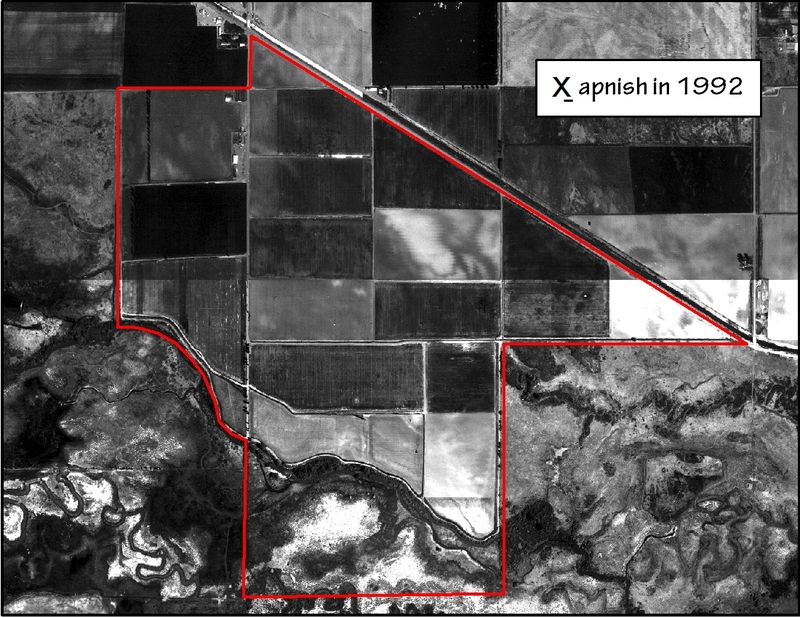 Later in 1965 the lands of the Double Z Ranch were used for both duck hunting and open ranching. This farm has always been dependent on a series of earthen dikes to prevent spring flood waters of Toppenish Creek from flooding its land. When the lands were purchased about one half of the earthen dikes were present. These were located along the western border of the ranch and along the western half of Toppenish Creek. From 1955 to 1956 the first earthen dikes were completed along the east border of the ranch and the east half of Toppenish Creek. The western earthen dikes have failed only twice once in 1955 and again in 1974. In 1974 with the help of a Federal disaster loan all of the dikes were rebuilt and restored. A series of earthen dikes were constructed in the early 1980’s to relieve the frequent flooding experienced by the property owner along the eastern half of the property. The excavation of a waterfowl pond for enhanced hunting opportunities also occurred during this time. Initial and subsequent cultural resource inventory of the property revealed the complete absence of archaeological material and features beginning in 1997 and ending in 2000. 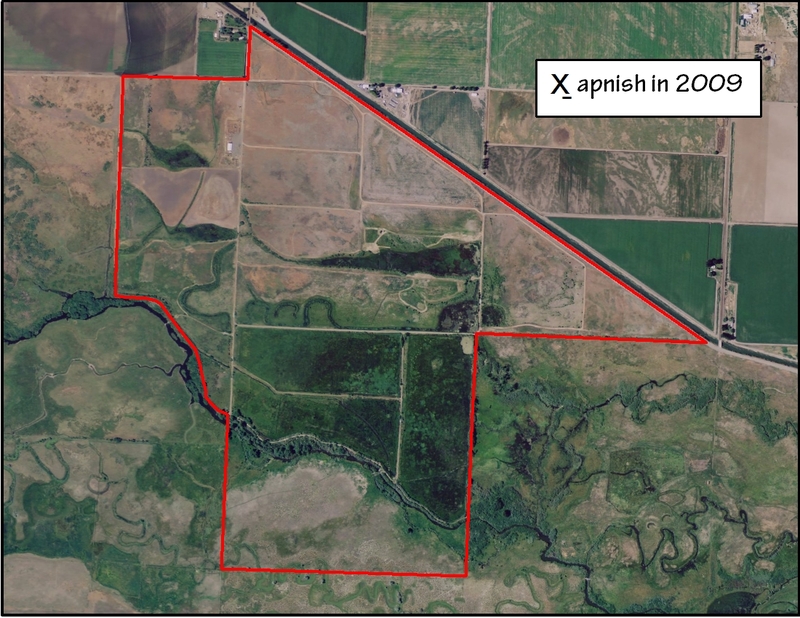 After acquisition by the Yakama Nation’s Wetlands Restoration Project several tributaries of Toppenish Creek were reconnected to restore naturally occurring riparian vegetation. This has allowed the Yakama Nation to restore many of its traditional use riparian plants. This is particularly true for tule (scirpus acutus) reeds that have re-populated the wetland areas with great success. One goal from a Yakama cultural perspective would be the successful propagation of willow, cottonwood, chokecherry, serviceberry, elderberry, wild rose, and current native species. The restoration of this property’s riparian ecosystem provides tribal members excellent hunting opportunities in the harvesting of traditional food resources such as waterfowl. Restoration and the reconnecting of previously altered tributaries of Toppenish Creek provide fish passage for anadromous fish migration that have been obstructed by manmade diversions. After a 75 year absence wapato (aka arrowhead root, duck potato) or wáptu has returned to the South Lateral A property. As part of her Master’s project, Emily Washines documented the story of the wáptu and its return. The film was submitted to Ecotrust’s "Stories From Our Watershed" film contest and won honoroable mention. Click link below to view this film and learn more about wáptu. Restoration Goals: In February 1995, initial restoration goals were developed for this property. The following goals contain an update of these original goals. Re-establishment of the north channel of Toppenish Creek on the property in such a manner that natural flows are allowed to return through the property and on to the adjacent lands downstream. Restoration of the floodplain landscape as close as possible to a pre-irrigation condition. This includes reestablishing natural land contours and hydrologic conditions necessary for wetland, riparian and upland restoration. Restoration of native vegetation communities associated with the floodplain landscape. Manage lands to provide benefits to wetland and riparian associated wildlife. This includes the reestablishment of reproduction habitat for waterfowl, upland game birds, wetland and riparian dependent songbirds, and furbearers. This also includes feeding, migration, and wintering habitat for herons, sandhill cranes, waterfowl, raptors, songbirds, and other wetland and riparian associated species. Manage lands to provide benefits to anadromous fish. This includes the restoration of riparian tree and shrub communities to shade the creek and to provide woody debris for juvenile hiding cover. Provide flow management in wetlands to allow passage of adult and juvenile salmonids. 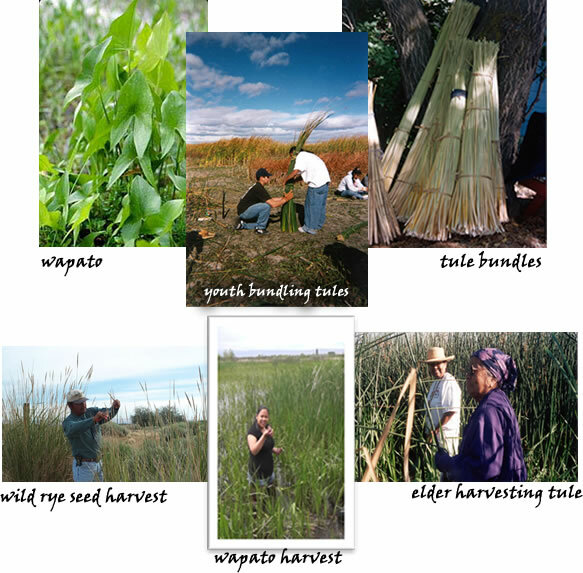 Restore culturally important vegetation for traditional use by the Yakama People. This includes tule and great basin wild rye enhancement. Provide access for traditional resource utilization for Yakama enrolled members. Provide supervised access for the non-enrolled public for the purposes of small game hunting, non-consumptive wildlife activities, and educational purposes. Toppenish Creek reconnection: In 1995 a large landscape restoration project was implemented. This project used historic aerial photographs to recreate, as best as possible, the pre-irrigation landscape features of the property. In 1996, additional restoration was completed to enhance the flood passage capabilities of the property. Landscape restoration: In addition to the creek channel reconnection, the 1995 project was also designed to recreate, as well as possible, pre-irrigation landscape conditions. These included channel, wetland and upland area recreations according to historic photos and current landscape constraints. Native vegetation restoration: Because the Toppenish Creek corridor still contains a source of native wetland and riparian plant seed, most of the revegetation of these areas is being allowed to occur naturally. The exceptions to this are the limited areas that were planted with willow and cottonwood cuttings in 1996 and 1997 by the Salmon Corps crews. These plantings occurred along the channels and wetlands recreated in the 1995 project. Upland areas are being replanted to Great Basin wild rye. Weed control activities are necessary during initial revegetation. Once the native vegetation becomes established, little weed control is required due to the competitiveness of the native plant communities. Wildlife management: The actions described above also benefit the wildlife resources of the property. 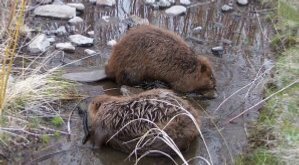 In addition the benefits derived from hydrologic and habitat restoration, conditions favorable to wildlife will be maintained through strict control on human access into the property. 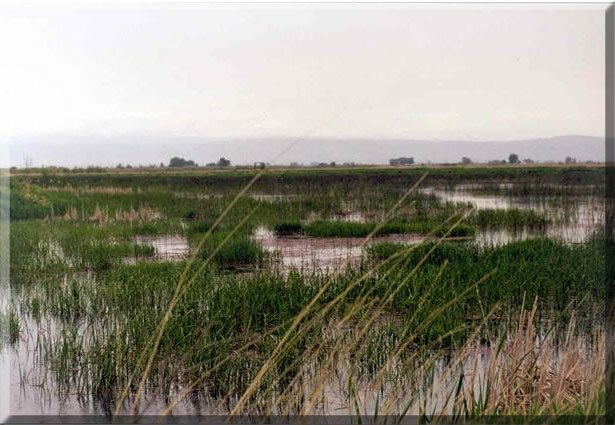 Because a major portion of the Yakama Nation’s Wetland and Riparian Restoration Project is devoted to the restoration of native plant and hydrologic conditions (habitat), artificial nesting structures will only be used under very special circumstances. There are currently no plans to utilize them in any matter on the property. Anadromous fish management: As with wildlife, the anadromous fish goals are tied in to the restoration of the hydrologic and vegetative conditions. Restoration of native hydrologic conditions provides for safe passage by adult and juvenile salmonids. Wetland and floodplain reconnection allows for the natural recharging of groundwater necessary for maintaining the quantity and quality of water necessary for salmonid needs. Though steelhead juveniles are known to spend much of the winter rearing in this portion of Toppenish Creek, the extent of their use of this property is currently unknown. 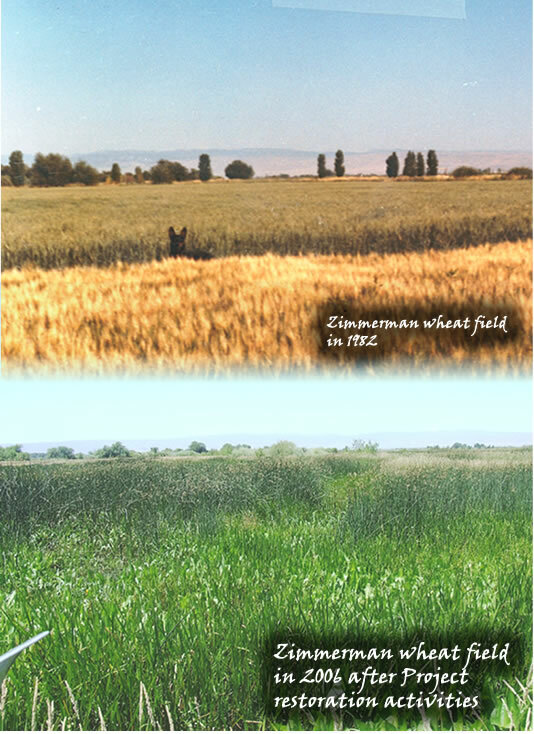 Cultural resource restoration: Natural revegetation has allowed for a large increase in wetland plants important to the Yakama People. Once again, this is due to the efforts of restoring the native hydrologic and landscape components of the property. Tule beds, nearly non-existent when the property was farmed, are now common enough to provide harvest opportunities each year to many tribal members. As the upland and riparian areas develop, they will also soon be providing opportunities for the harvest of wild rye, dogwood and wild rose. Wildlife resource use is occurring in the form of waterfowl harvest. Yakama tribal members use of the property for waterfowl harvest is increasing annually. Access for resource utilization: Fences and gates have been installed on the property to restrict the accessibility of the property. An access management plan (next section) has been developed to ensure that the human use is compatible with resource protection and enhancement. The property has proved to be very attractive to those partaking in tule and waterfowl harvest activities.